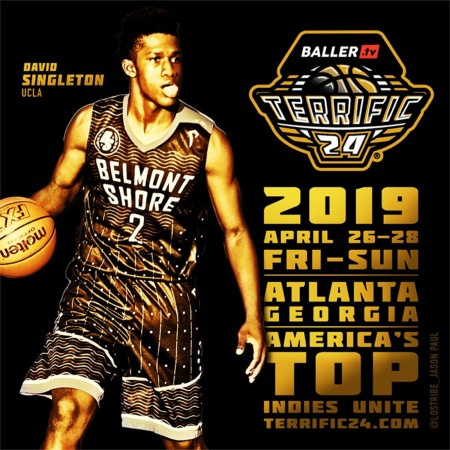 The 4th annual Terrific 24 is set for Friday-Sunday April 26-28, 2019 in Atlanta GA area, not far from the LakePoint Sports Center where the Nike EYBL will be held that same weekend. Y-n-R (IL), BTI (CA), Wisconsin United (WI), Northern Kings (Canada), Dallas Mustangs (TX), Texas Boys Basketball Club (TX), Team Melo (MD), LA Rockfish (LA), Vegas Elite (NV), DFW Defenders (TX), RL9 (TX), Philly Pride Black (PA), Lone Star Elite (TX), Georgia Tornadoes (GA), Power Factory (AZ), Impact Elite (FL), UPlay Canada, Nike Pro Skills OK, Grassroots Indiana (IN), Minnesota Powerhouse (MN), Team Legit (IN), Pocket City (IN), Born Ready Elite (NY), St. Louis Prospects (MO), The House (MS), Alvin Gentry Elite (AZ), MemphisHoopers.com (TN), Greenwood Elite (MI), Team Superstar South (AR), Tyler Johnson Elite (CA), New York Dragons (NY), NY Havoc (NY), Fundamental U Grey (IL), Squires Richmond (VA), Detroit Spartans (MI), Team KC (MO), Team SAC (AL) and Illinois Bears (IL). Over 150 college coaches have attended each year including head coaches Tom Izzo (Michigan State), Tom Crean (Indiana), John Belein (Michigan), Ben Howland (Mississippi State), Dana Altman (Oregon), Matt Painter (Purdue), Scott Drew (Baylor), Andy Enfield (USC), Jerrod Haase (Stanford), Jamie Dixon (TCU), Mike White (Florida), Leonard Hamilton (Florida State), Jamie Dixon (TCU), Archie Miller (Dayton), Chris Holtmann (Ohio State), Johnny Dawkins (Central Florida), Marvin Menzies (UNLV), Rick Stansbury (Western Kentucky), Mike Hopkins (Washington) and Fran Dunphy (Temple) and assistants from UCLA, Iowa, Maryland, Marquette, Creighton, Butler, Notre Dame, Cal, West Virginia, Iowa State, Pittsburgh, Utah, North Carolina State, Texas A&M, Miami FL, Nebraska, Oregon State, Auburn, Georgia, Cincinnati, VCU, DePaul, Seton Hall, Texas Tech, Clemson, Tulsa, Rhode Island, Wyoming, San Jose State, UC-Irvine, Bucknell, Yale, Princeton, Penn, Davidson, Old Dominion and Pacific.